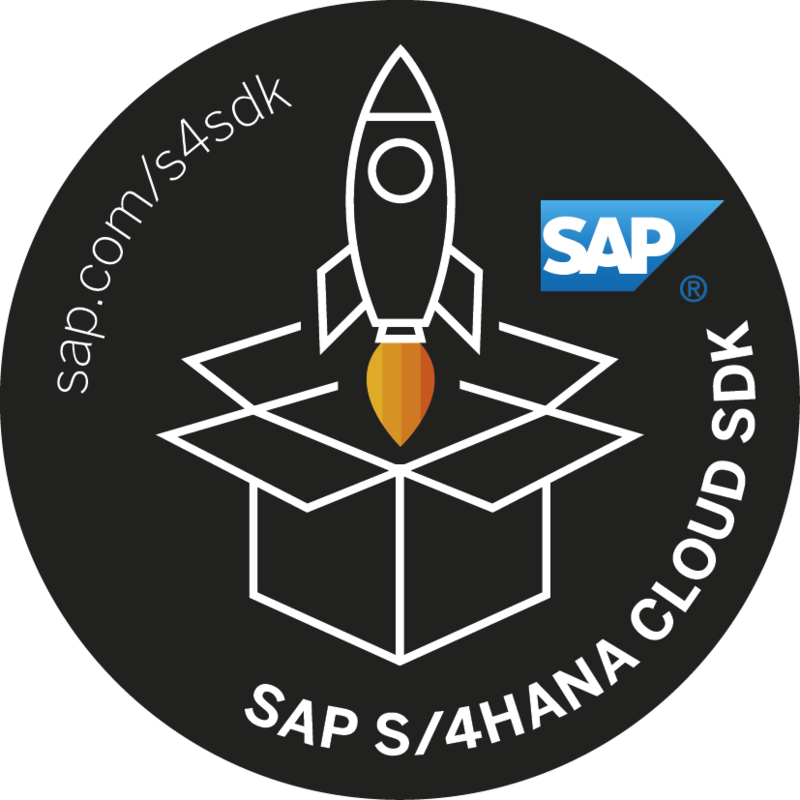 The following tutorial will introduce you to the latest features of the S/4HANA Cloud SDK regarding extensibility, eager and type-safe expand as well as dependency injection with the Virtual Data Model for OData for any SAP S/4HANA system. 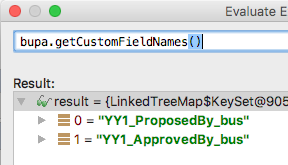 How you can use custom field extensions from S/4HANA within the virtual data model for OData. How you can join connected entities from the virtual data model in eager fashion. How to leverage dependency injection to decouple your client code better from the SDK-provided classes. As the basis for all three features we will use the following GetBusinessPartnerCommand to the business partner API which has been wrapped into a resilient Hystrix command. The call itself requests the first- and lastnames from all business partners which are customers. Hint: Both files go to: <projectroot>/application/src/main/java in your generated project structure. Please put them either into the default package or some newly created package (e.g., com.yourcompany). If you have a similar result, you are ready to proceed with this tutorial. Oftentimes, businesses require to enhance the standard data model of the SAP S/4HANA system. Using tools of the so-called In-App Extensibility concept, key users are able to introduce additional fields to certain data structures. As an application provider, this mechanism can be also used to introduce new data fields which are relevant to your application extension. 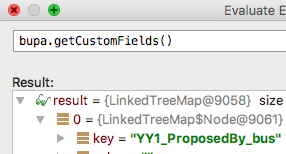 Either way, we want to be able to consume and work with such custom fields in our application code. 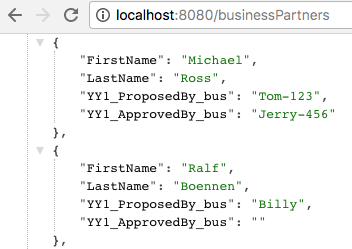 In our example, we have enhanced the business partner data model with two custom fields to record by whom the business partner was originally proposed (field: YY1_ProposedBy_bus) and if the business partner was approved after proposal (field: YY1_ApprovedBy_bus). We did this modification by the so-called In-App extensibility capability of SAP S/4HANA which you can use based on your Fiori Launchpad with an authorized user. You can check out Thomas Schneider’s great blog for more details: The Key User Extensibility Tools of S/4 HANA. Based on this extension we can, for example, check which business partners have to be approved and if they are, we consider them as valid business partners. Based on these two extended fields, we can now use these two additional fields as part of our projection criteria. As we are only interested in extension fields from the business partner, the API only accepts extension fields typed under BusinessPartnerField. As a small demonstration, we would like to expose the clients of our application a nicer representation as we do not like these too technical extension field names. Therefore, we write our own business partner entity called MyBusinessPartner that inherits from the provided BusinessPartner entity. Feel free to bring in here even more capabilities such as a type safe proposer/approver and the like. In addition, you may write your own serializer using the Jackson framework. So far, we have been working with the BusinessPartner entity only. However, this is merely the root entity of a more complex data model. For example, each BusinessPartner can be associated with zero-to-many BusinessPartnerAddresses which again can be associated with zero-to-many BusinessPartnerEMailAddresses. Another popular association in an ERP context are header-item relationships such as an invoice header and invoice line items. This can be a beneficial approach in cases where the entities contain large data volumes and the interaction with the data allows for a step-by-step resolution of the model (e.g., lazily loading entities for the UI). 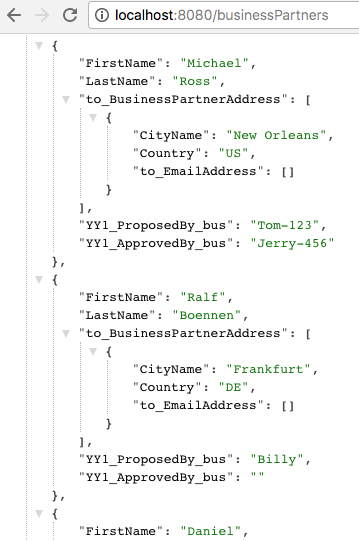 However, if you want to get addresses of many business partners, this approach leads to significant performance issues as each method call corresponds to one remote function call to the S/4HANA APIs. Furthermore, the lazy fetch also gets all fields from the connected entity per default, however, sometimes we may want to select only certain fields. In such cases, we rather prefer to resolve the association already eagerly upon the first API call. In OData language, this is called an expand on navigational properties, in SQL speak this refers to a left outer join between parent and child tables. 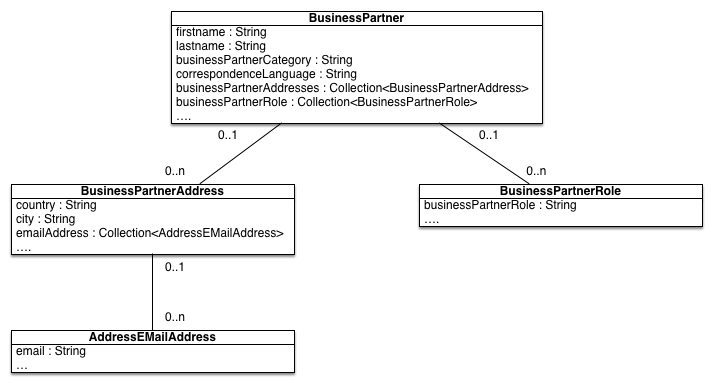 In the example below, we present an example that expands for every business partner its corresponding list of addressed, followed by a partial projection on the City and Country properties of the associated BusinessPartnerAddress entity, followed by another expand to the AddressEMailAddress entity where we project on the EMail_Address property only. 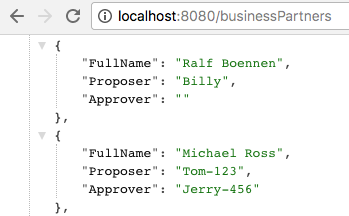 Readers who are familiar with the OData query language might wonder about the missing expand() syntax. 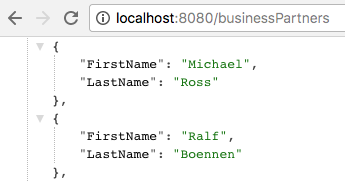 In the OData query language, expand and select are two independent keywords. In the OData VDM for Java, we have decided to combine both methods with each other to keep up the type-safety principle. Unfortunately, the type-system of Java is not powerful enough to preserve the type information from an explicit expand() statement to an underlying select() statement. We believe that the proposed solution of using a fluent select API over connected entities is better suited for a clean and safe Java API. This method either returns the list of connected entities, if previously eagerly fetched or will lazily fetch the entities, if not. Therefore, this method guarantees to not return any null values but might break due to a thrown ODataException, in case a lazy fetch is initiated due to missing authorizations, timeouts or system unavailability. This method returns an Optional of the return type signifying that the connected entity might be null as no lazy fetch is initiated. Therefore, this method guarantees to do no lazy fetch but cannot guarantee to return a value. As a consequence, this method also does not throw any ODataException. With SAP S/4HANA Cloud SDK version 1.5.0, we have also introduce the possibility to use dependency injection with the virtual data model for OData and BAPI. In a nutshell, dependency injection is a major object-oriented inversion of control principle that allows to decouple the call direction from the initialization direction. This leads to less coupled dependencies which are easier to maintain, for example, if a dependency changes, the client does not need to be touched. Sounds complicated? Nope, it is really a 25-dollar term for a 5-cent concept, however, it makes your code cleaner and less dependent on the actual implementation. This unnecessarily exposes implementation details to the client code. Instead, in our client code we just want to declare which kind of interface we would like to consume and get the corresponding implementation “injected” from the outside during runtime to achieve a higher degree of decoupling. That’s it: The only thing we really did is get rid of the new DefaultBusinessPartnerImplementation() term. Therefore, in the future whenever the implementing service changes (it’s name, it’s package, it’s module, etc.) your client code will not notice this and is therefore less prone to changes. In this tutorial, we have shown how you can leverage the latest capabilities of the Virtual Data Model for OData using the SAP S/4HANA Cloud SDK. This includes to use custom fields from SAP S/4HANA within all your logic, type-safe expand features for GET calls as well as dependency injection of our VDM service classes. This gives you even greater capabilities and lets you integrate with SAP S/4HANA even faster and easier.